A long established certitude in the discipline of economics is that technological advances leads to the elimination of jobs in certain sectors of the economy, concurrently replacing the vanished jobs with even better ones. That economic prosperity led to job creation and wealth creation—more jobs = more wealth = more jobs—was also an unquestioned truism. Recent events suggest, however, that these two certitudes no longer apply, at least in advanced economies like ours. While these problems are widely debated, they are also too little understood. In Race Against the Machine, leading technology scholars Erik Brynjolfsson and Andrew McAfee provide an engaging, powerful, essential exploration of the forces and their consequences defining the economy in the 21st century. •	The number of workers employed in the U.S. in agriculture has declined from 90% in 1800, to 41% in 1900, and only 2% in 2009. Thus new industries have created new jobs for 88% of the workforce in the last two centuries. •	Since information technology was first recognized by the U.S. Department of Labor in 1958 as an official job classification, jobs with information content have increased to 60% of the economy. The power, speed, and transformative impact of computer and communications jobs have accelerated at an even more rapid pace, following the famous Moore’s Law, which promulgates that speed and power of microchip capacity double every 18 months. Since 1958, there have been 36 such doublings. The changes now occurring, off of an ever larger base, are consequently ever more impactful. Opening with a succinct, incisive summary of various economists’ diagnoses regarding why jobs are disappearing, the authors insightfully observe that technology’s effects are generally ignored by economists, who mostly operate with dated, ever less relevant theories, paradigms, and models about how the world works. Still, as incisive as is this commentary—which is far superior to the vast majority of what has been written on the challenges of jobs disappearing—the role of place choice and changing place competitiveness are insufficiently addressed. Mostly disregarded by economists is how the consequences of place choice and the technologies that have accelerated the expression of place choice have replaced the production of society’s goods and services, in the process transferring the places of work and the places of consumption. Significantly, many U.S. based companies are growing jobs—but in places outside of the U.S. And many U.S. based companies are increasing sales—but, again, much faster outside the U.S. Furthermore, the forces of globalization lead to C-level executive positions to be represented by an ever more diverse complement of executives—NOT from the US. The authors develop the idea that the Information and Computer Technology (ICT) advances are the latest of four General Purpose Technologies (GPT), which each had broad impacts and stimulated cascades of innovations. Whereas the prior GTPs—steam power, electricity, and the internal combustion engine—were concerned with dramatically increasing manufacturing productivity (steam power), enhancing place experience (electricity), and extending personal mobility via transportation advances (internal combustion engine), the latest GPT, both bridging and connecting distant places, as ICT overcomes the constraints and limitations of distance and geography, so far has destroyed more jobs than it has created. 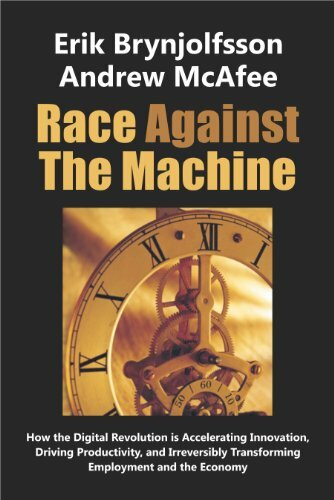 Race Against the Machine is a most reasoned, logical assessment of the causes of job losses and the future of jobs. Since jobs are the number one issue of the day, everyone with a leadership responsibility for and who is concerned about the future of the country’s economy needs to read this book. Supported and illuminated by a series of powerful graphic displays of key changes and realigned relationships, Race Against the Machine is simultaneously sophisticated, yet accessible, balanced in treatment and not ideologically tilted. And, the authors anticipate readers’ “What do I do now?” question by offering a number of actionable policy recommendations. This vitally important book merits the widest of readership.